Vegan French Onion Stew-oup Quick! 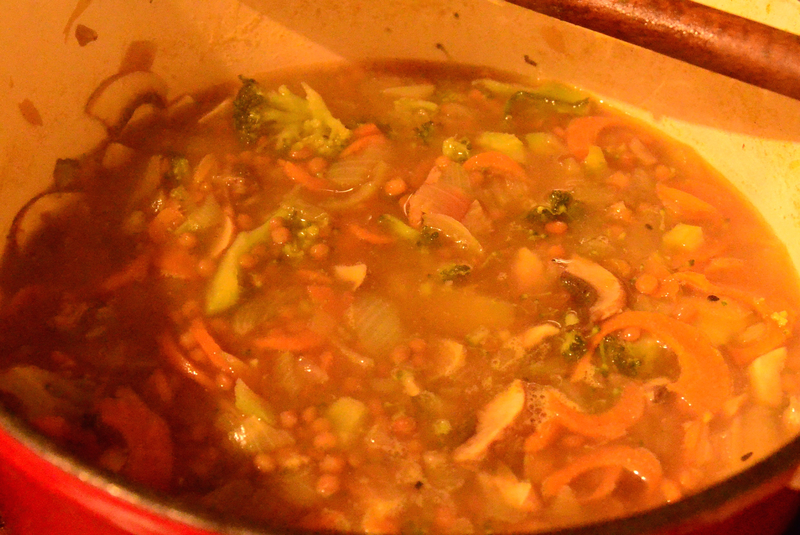 This was going to be a light broth-y soup with veggies, but I wanted to make it a bit more hearty and filling with puy lentils and it kinda ended up stew like. 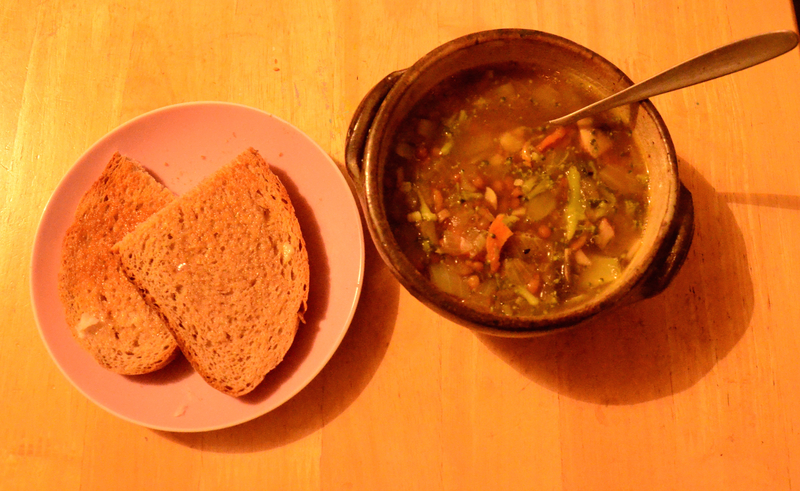 Hence “Stew-oup!” It turned out super tasty, if I do say so myself. It is fast to make ,including prep and leaving it cook it took only 45mins. That said I did cheat. I came in from work, and for various reasons it has been an exhausting week. I had not soaked puy lentils, I did not want to wait forty minutes for them to cook (Here end-th the excuses). O but the joy of organic canned puy lentils! The ones I get are an English brand, they are only in water- no salt, no sugar no preservatives…no waiting! A bit more than a cup of cooked puy lentils or a 240g (dry weight) tin of them. See the bottom of the post for footnotes! The quick way is simple. Toast your bread. Cut a clove of garlic in two. Rub the garlic on the toast- it should actual wear down a bit. Scrape on your coconut oil or drizzle your olive oil. Season with black pepper. Ta-Da! Garlic Toast! If you have time you could of course make proper garlic bread in the oven, but this is a quick work night dinner! I have listed the ingredients in the order you put them in. Put your pot on a medium to high heat. Melt your organic coconut oil or let your peanut oil warm up. Coconut oil can be safely heated to 225C and peanut oil can go up to 215C. Add your nigella seeds and yellow mustard seeds ( they should sizzle when added). Add your black pepper and ginger next. 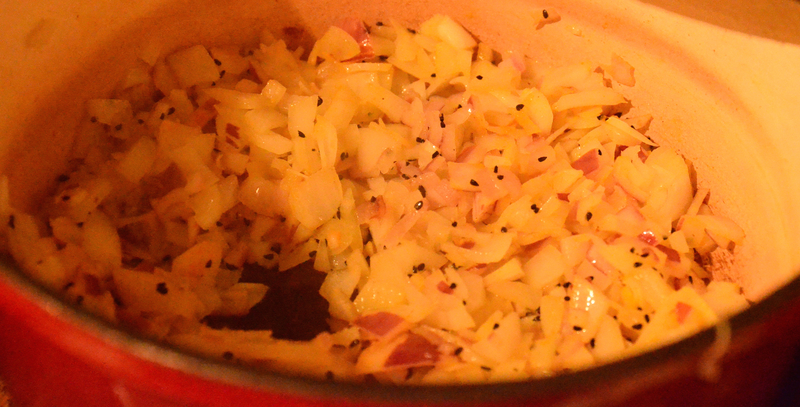 Now add your chopped yellow onion. Chop your red onions and add these. Add your salt. After a couple of minutes add the turmeric. 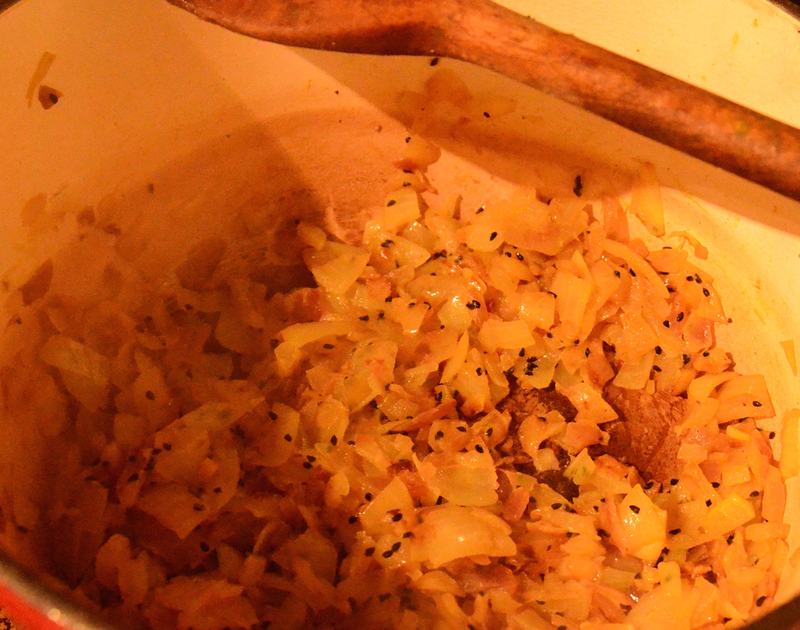 At this stage put the lid on to allow the onions to sweat and cook. You need to keep an eye on them and give them the odd stir, they can easily burn. Once they have shrunk down and are lovely and transparent add the mustard. Give it a stir. Add your homemade stock or stock cubes and water, bring it all to a simmer. Pop in the broccoli. 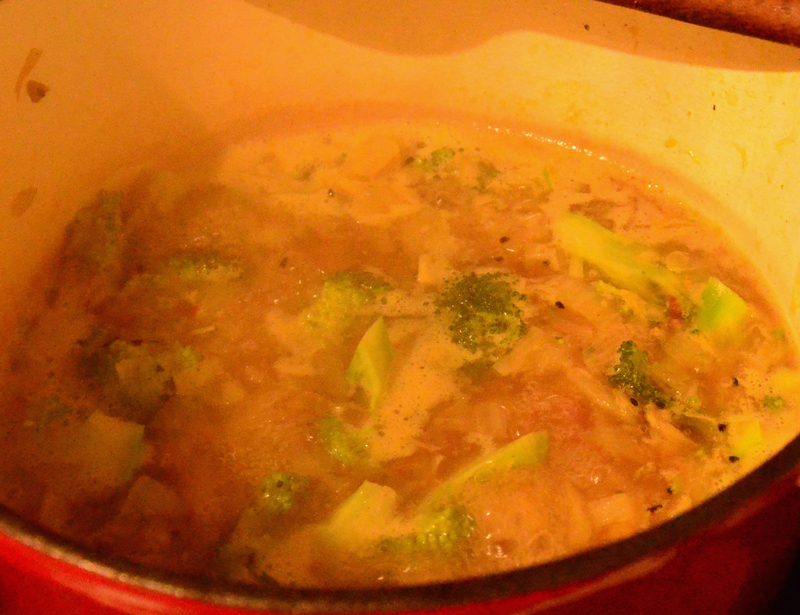 I chopped each of the florets of broccoli in three so that they were nice and thin. This means they cook quickly and are easier to eat if you are just using a spoon to have your “stew-oup”. 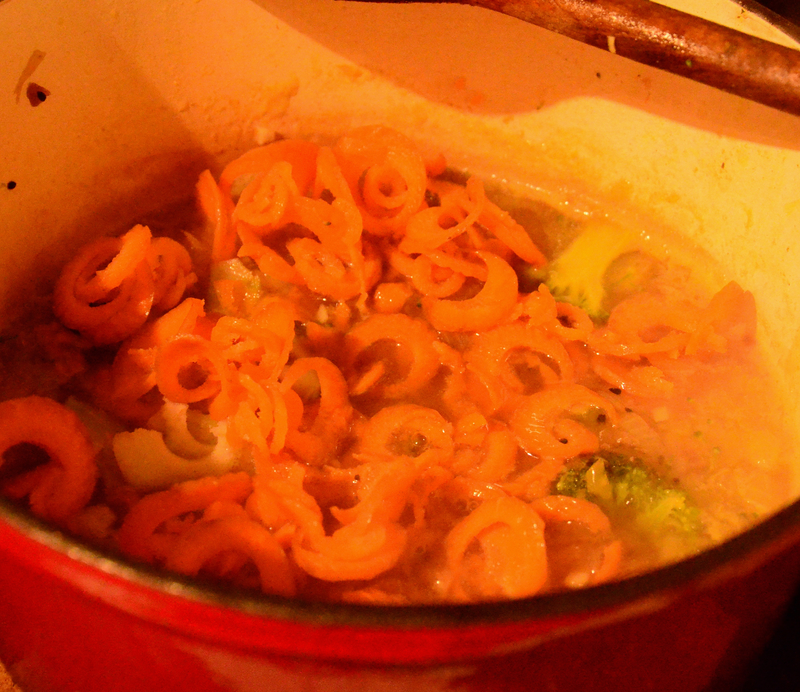 After a five minutes add spiralized or shaved carrots. Chop your Portabello mushrooms and add these. Add in your cooked puy lentils. Let it all to come back up to a light simmer. Now put in your cold pressed extra virgin olive oil. Extra virgin olive oil has a burning point of 100C. I do not use it on a direct heat, aside from the trans fatty acids the flavour would also burn off! Add the rest of the salt and pepper. Taste your concoction to check the vegetables are cooked and if it needs more seasoning. And almost time to eat! Prepare your Easy Garlic toast and grab a blow. If you have fresh parsley chop a teaspoon and sprinkle on your soup when serving. You should have enough for two or three people. *the stock cubes I use have no hydrolysed vegetable protein or hydrogenated oil. Homemade stock can be made easily and in advance. Keep some your veg peelings or veg juice pulp for a couple of days in the fridge. You boil these for approx an hour with salt, pepper, an onion, a stalk of finely chopped celery,some herbs of your choice e.g.parsley, thyme, rosemary. A large teaspoon of miso paste is a lovely addition. Taste the broth to see if it is nice. Leave to cool a little and pass it through a sieve. You can use a sterilised kilner jar or passata jar to store it. Pour it in while still reasonably hot and fill to the tip top tip. The passata’s metal top should actually be sucked in a little by the heat and be sealed. When you open it it should make a popping noise like a jar does when you buy it new! This will keep for a good few days in the fridge. **If you do not have a spiralizer you can use a veg peeler to get long strips of carrot.